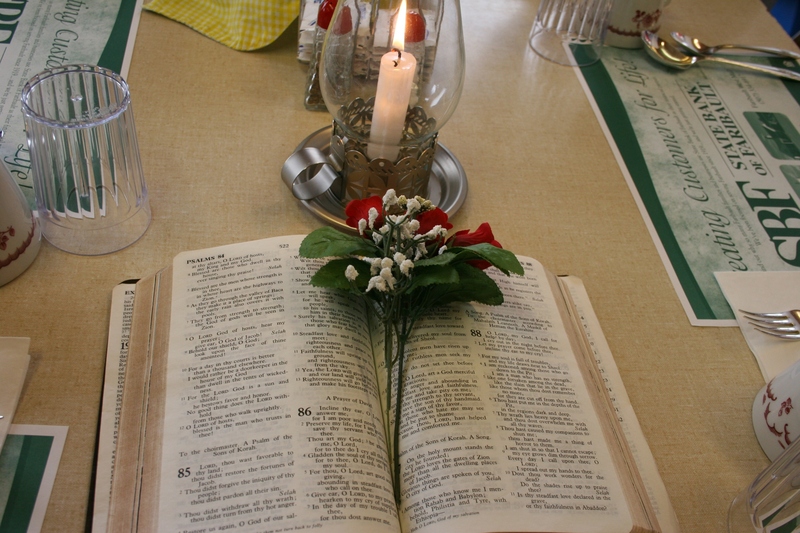 GIVEN A CHOICE of eating at a church dinner or dining at a restaurant, I’ll choose the holy place. 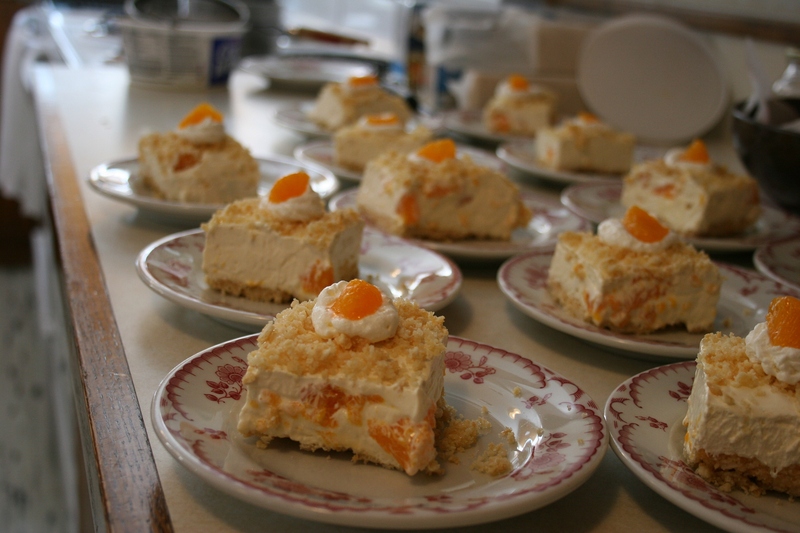 I appreciate the good home cooking and fellowship that comprise church dinners. 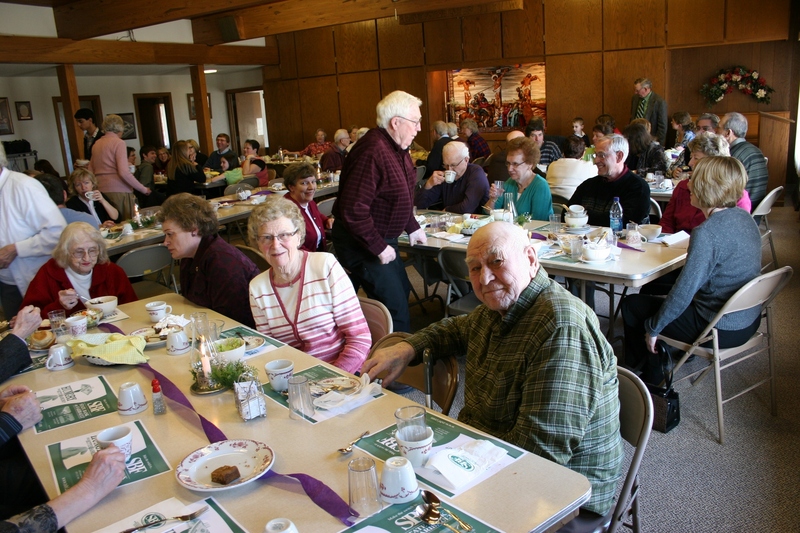 So Sunday my husband and I headed to St. John’s United Church of Christ in Wheeling Township, about a 15-minute drive from Faribault, for a Lenten Soup Luncheon. 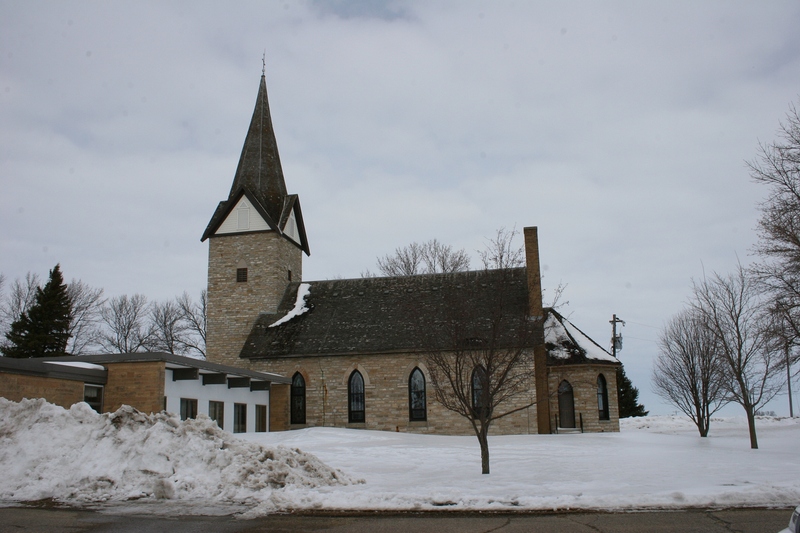 St. John's United Church of Christ is northeast of Faribault about two miles off State Highway 60 on Rice County Road 24 near Nerstrand Big Woods State Park. 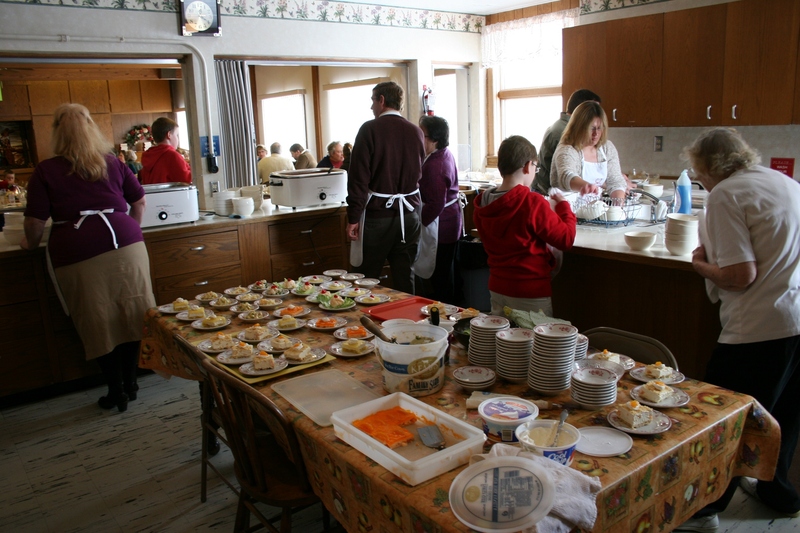 As soon as I stepped inside the fellowship hall attached to the old stone church and saw the spread, I regretted that I’d snacked on a doughnut at my church only an hour earlier. 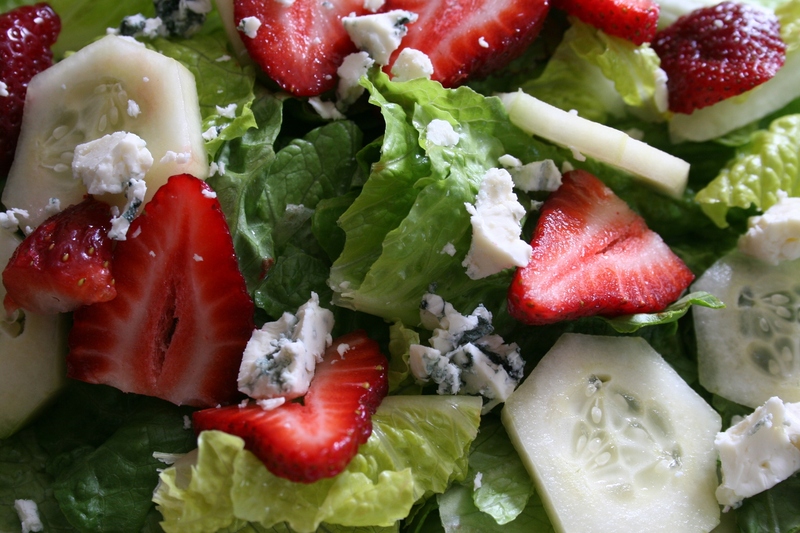 This luncheon offered soups, salads, sandwiches and bars. A regular smorgasbord with nine salad and three soup options and, well, I didn’t count the varieties of bars but suffice to say any chocolate lover would have been happy. 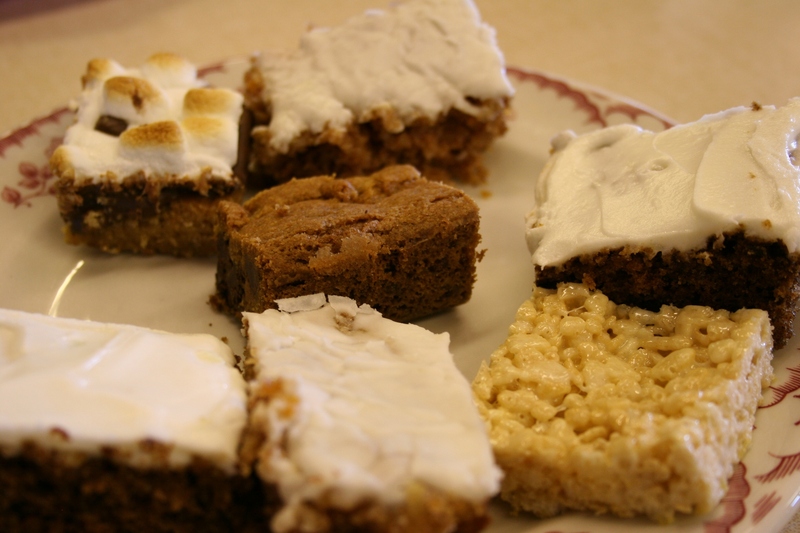 Some of the bars offered for dessert. I tried the bar with the marshmallow topping on the back left. 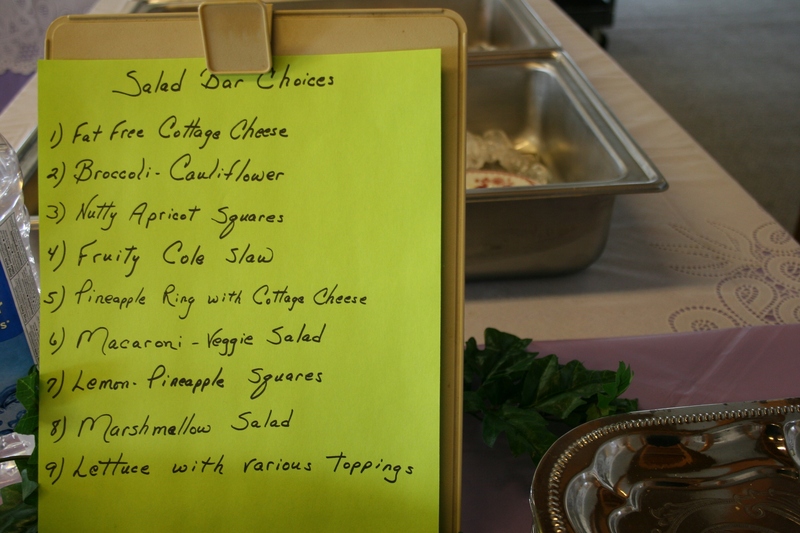 Salads like tuna pasta, tangy rhubarb squares and 3-bean, and the spinach-strawberry I chose, awaited diners who could select plated salads and/or build their own. 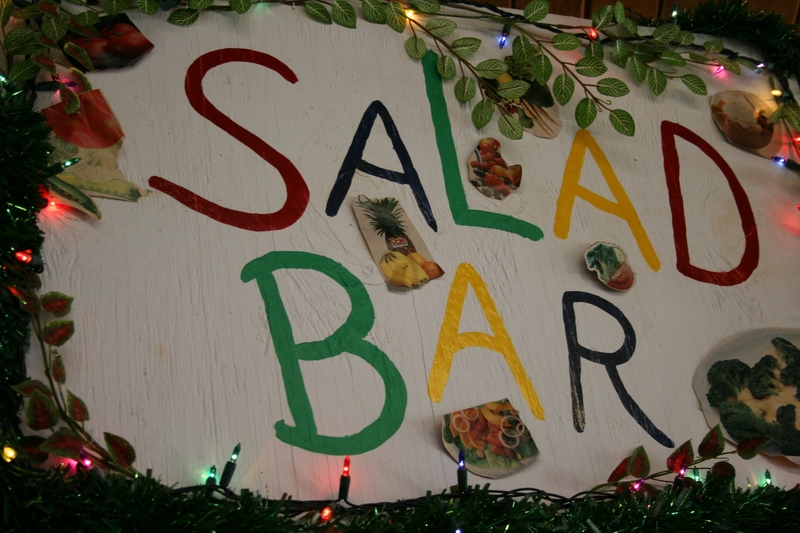 Even the salad bar sign grabbed my attention. 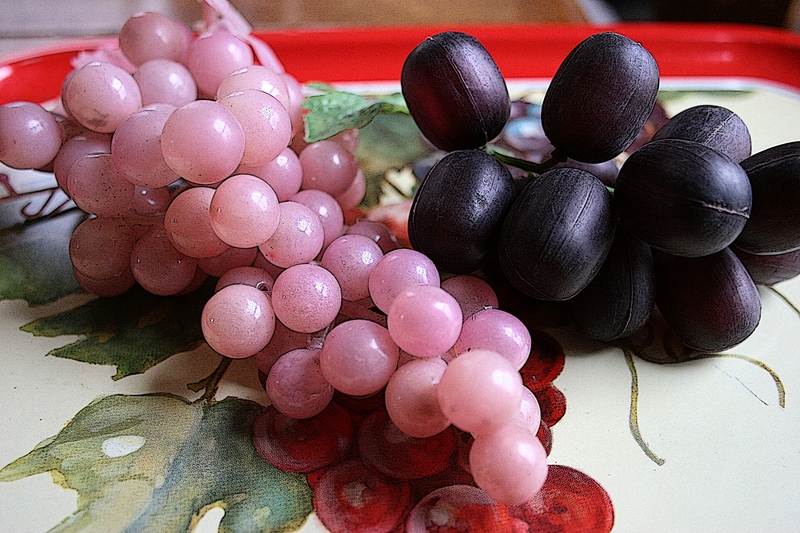 How cute and eye-catching and kitschy. 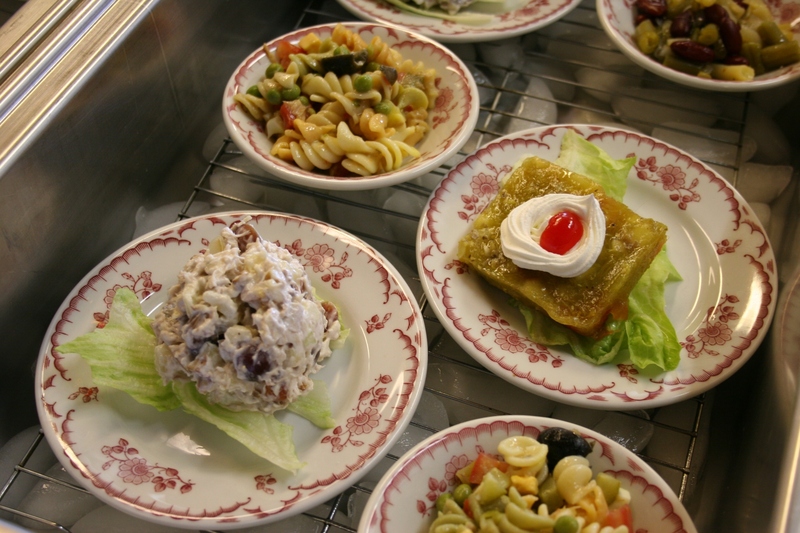 The plated and build-your-own salad bar fills two tables in the dining hall. 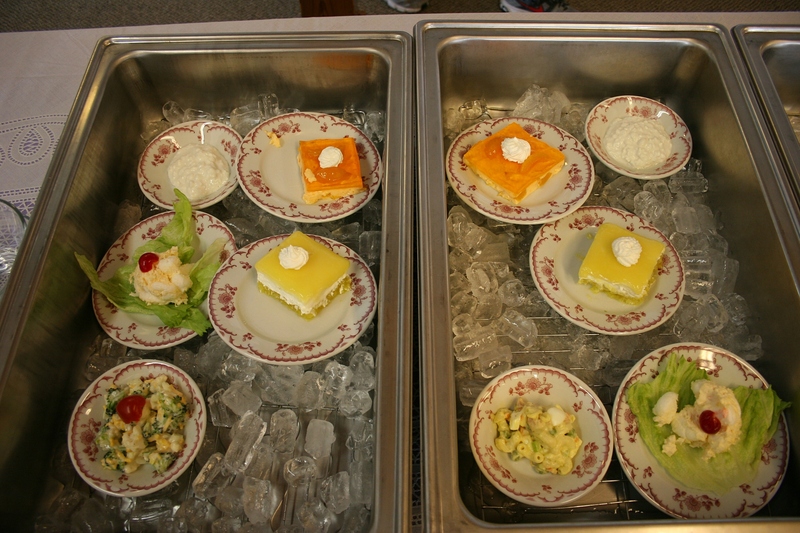 A few of the salad bar choices, including a tangy rhubarb square on the right in this photo. 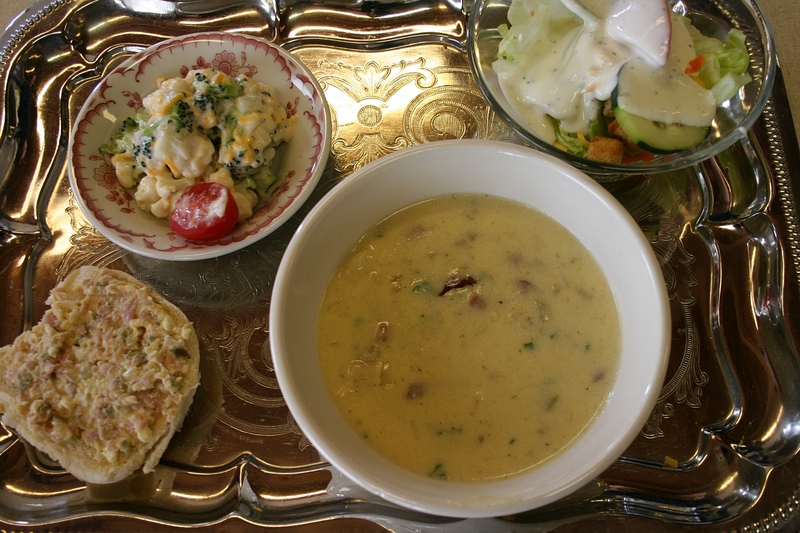 After I’d selected my salad and placed it on a fancy silver tray, I headed to the kitchen where cooks were ladling potato-bacon chowder, hamburger vegetable soup and chicken noodle with dumpling soup from large roasting pans into hefty bowls. 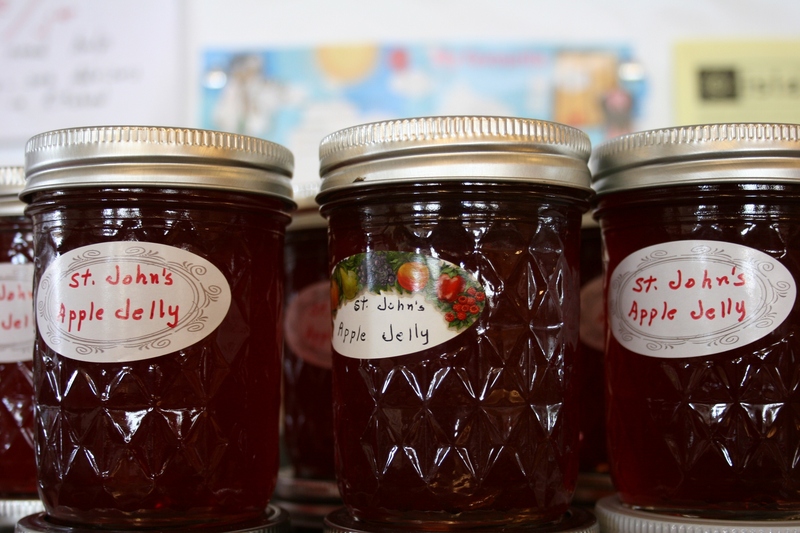 The busy-as-a-beehive kitchen crew at St. John's United Church of Christ. 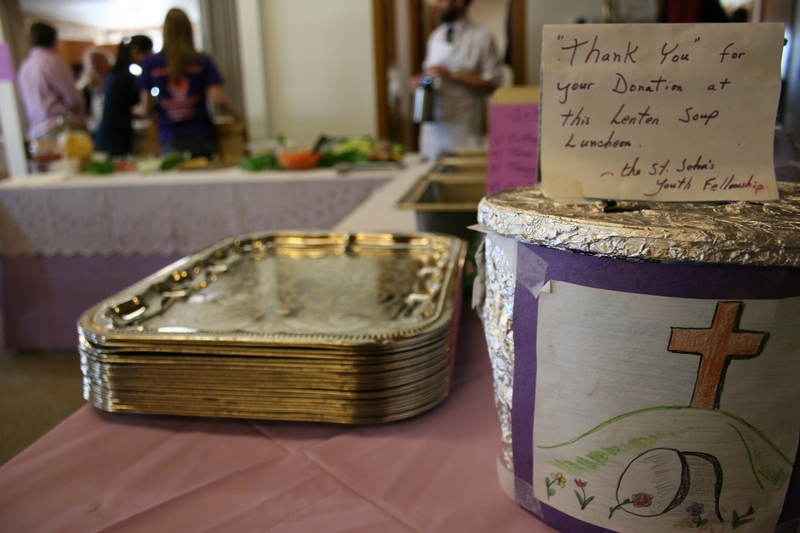 Volunteers were ready with roasters full of soups in the kitchen. I started with the potato and eventually sampled the other two. The creamy and savory potato was my hands-down favorite, although I also appreciated the spicy kick to the hamburger veggie. I’ve never been big on chicken noodle soup or dumplings. 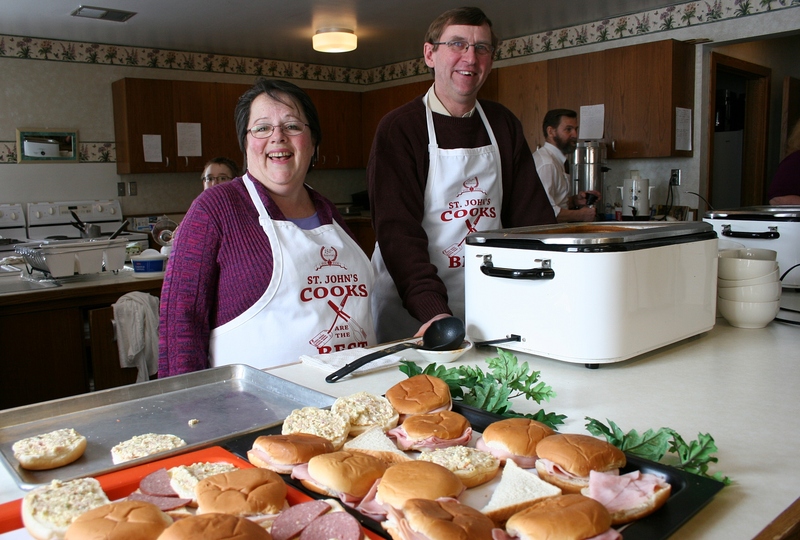 The chicken soup is served at every Lenten Soup Luncheon the church hosts. 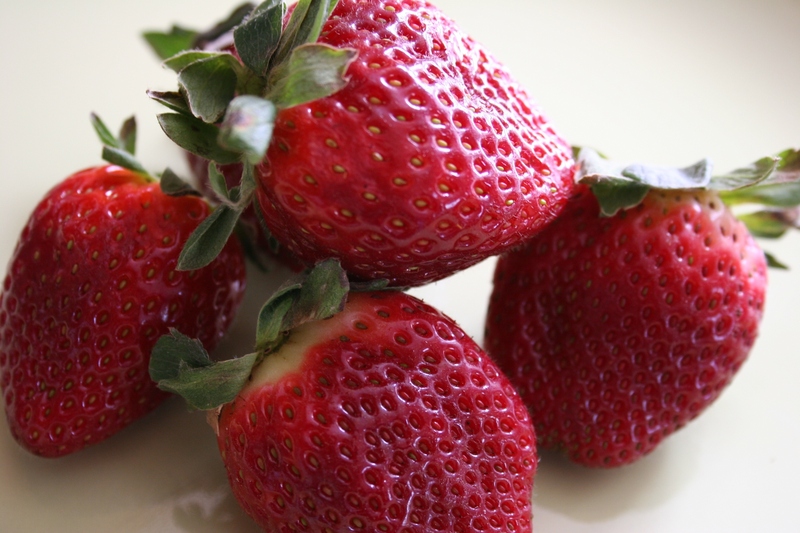 Oyster stew and chili will be the other featured soups at the last luncheon from 11:30 a.m. – 12:30 p.m. on Sunday, April 10. 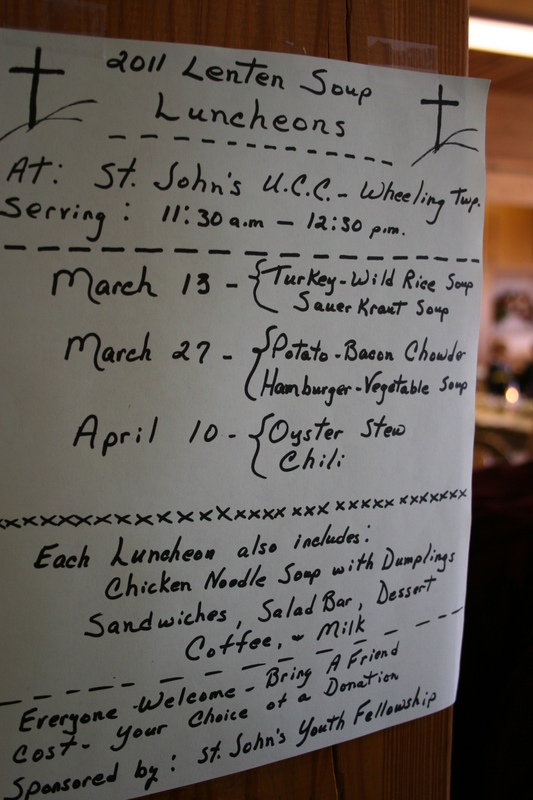 The Lenten Soup Luncheon sign posted by the kitchen. 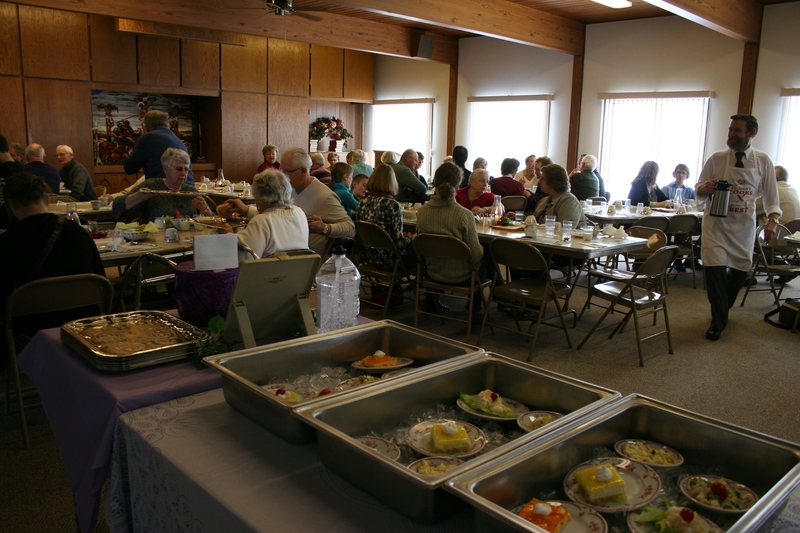 The final luncheon is from 11:30 a.m. - 12:30 p.m. on Sunday, April 10. 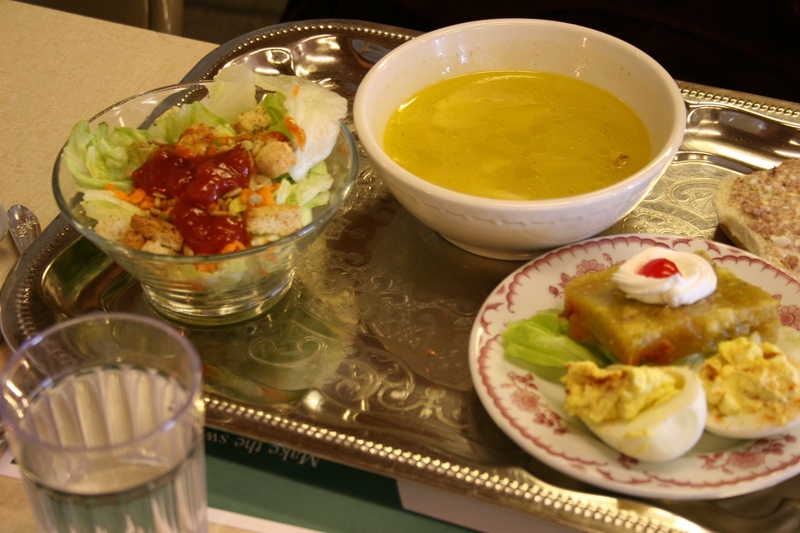 A diner's tray (not mine) that includes a bowl of chicken noodle soup with dumplings. 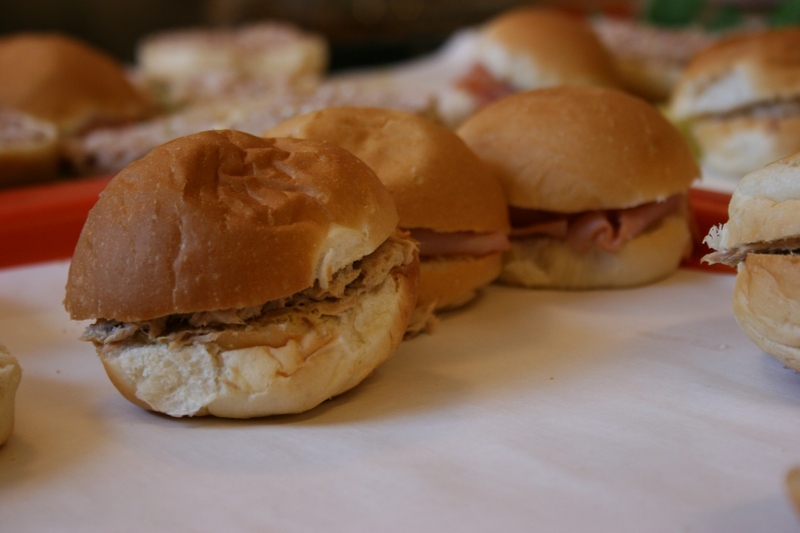 Church dinners are all about food and fellowship. I scored an invitation to visit a farm with a robotic milking operation while visiting with church members at my table. 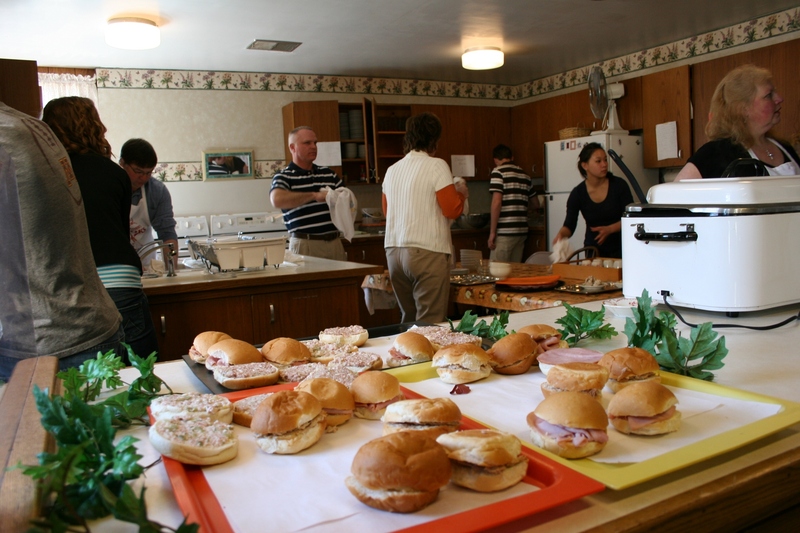 Of course, no church dinner is complete without bread, so diners were offered an array of sandwiches. I inquired about the ground concoction on an open-faced sandwich, was told it was bologna and pickles, paused, thought, and picked it up. And you know, for someone who doesn’t really care for bologna, I liked the spread. 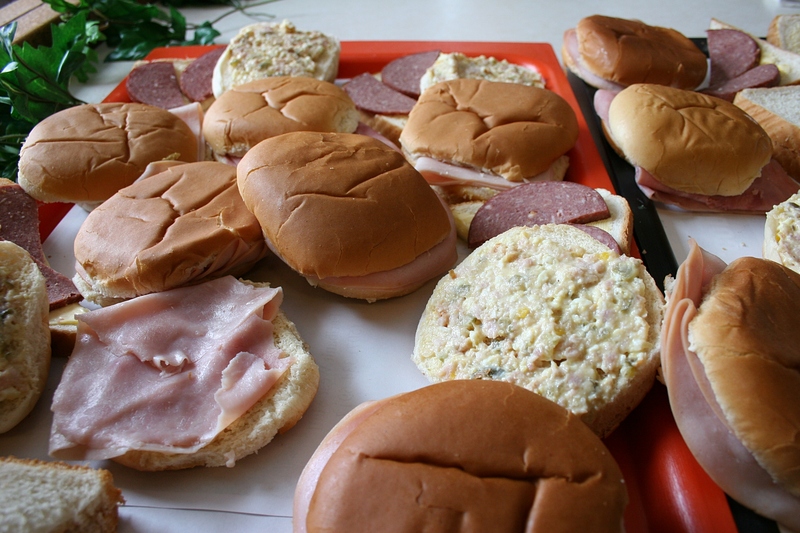 Plenty of sandwich choices like ham, tuna and, yes, even ground bologna and pickles were offered. 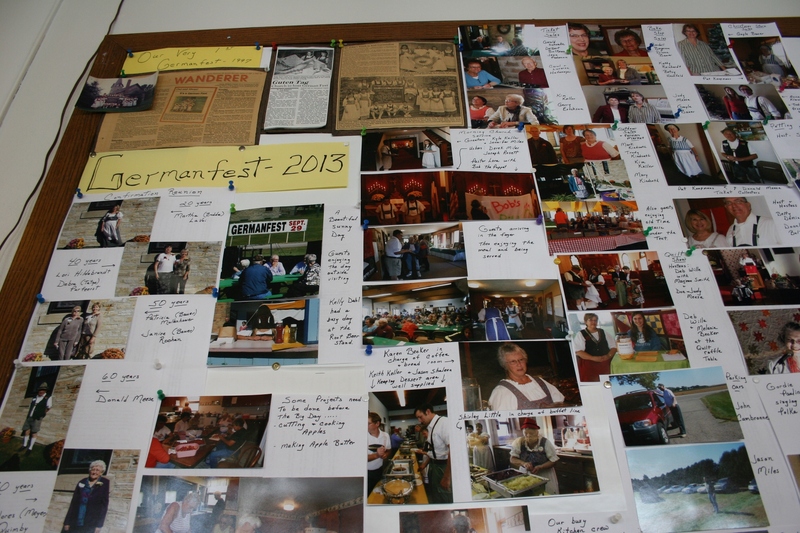 Except for lutefisk, I’ve never tasted a church dinner I didn’t like. 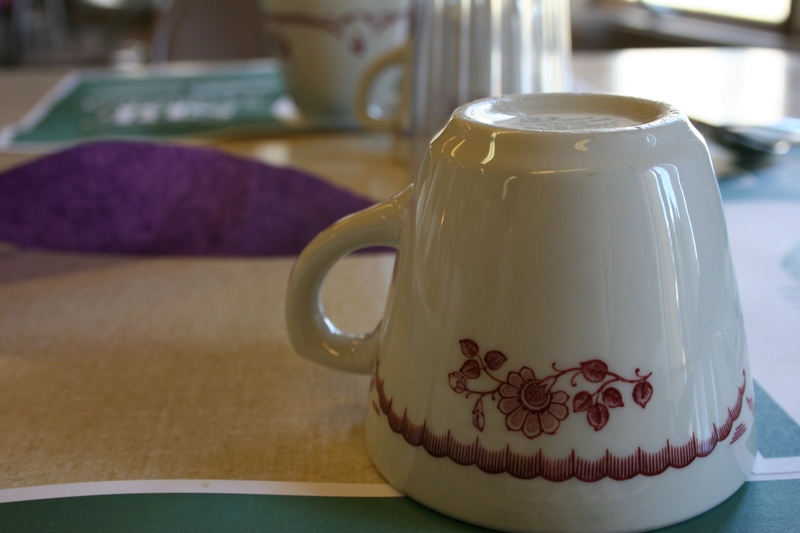 I notice and appreciate details like the lovely floral dishware. My husband and I learned that once you carry your food to your table on the fancy silver tray, you're supposed to take your plates and bowls off the tray and servers will pick it up for others to use. 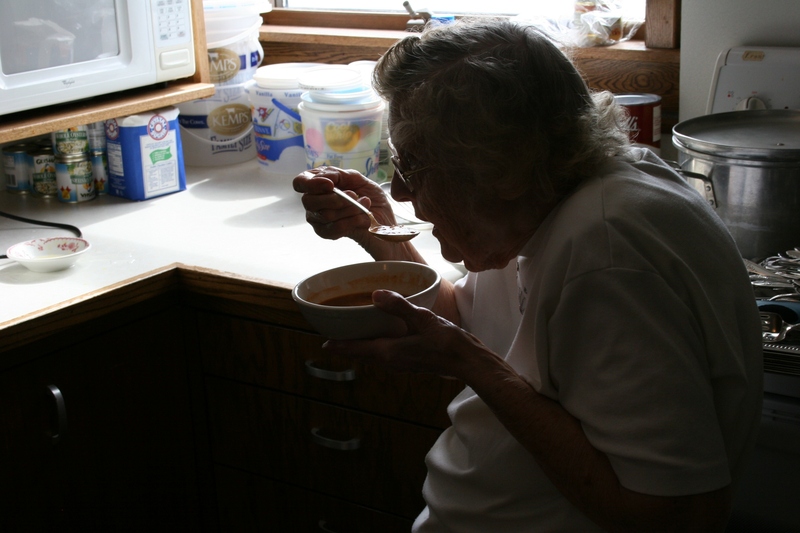 We even had big, hefty soup spoons for eating our soups. Now that impressed me. 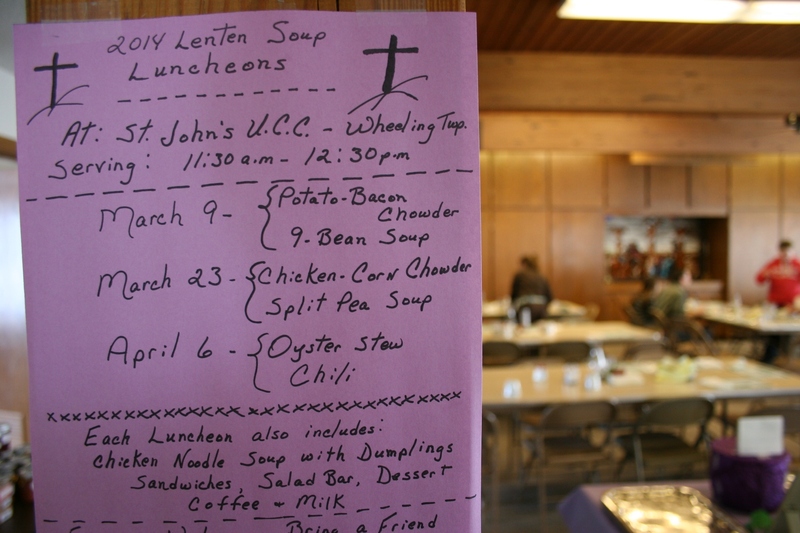 There's no specific cost for the St. John's Lenten Soup Luncheon, which benefits the youth fellowship group, helping members finance mission trips and more. Cost for the meal is whatever you choose to donate. 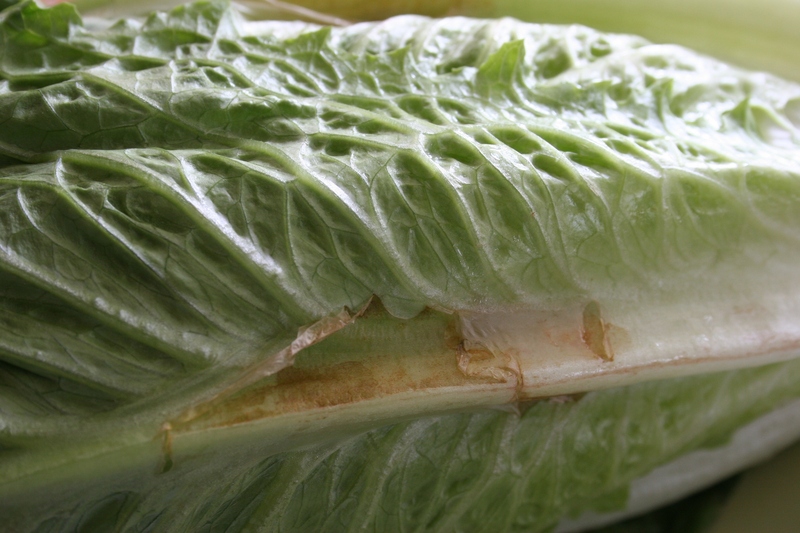 Just drop your money in the bucket before picking up a fancy silver tray at the salad bar. 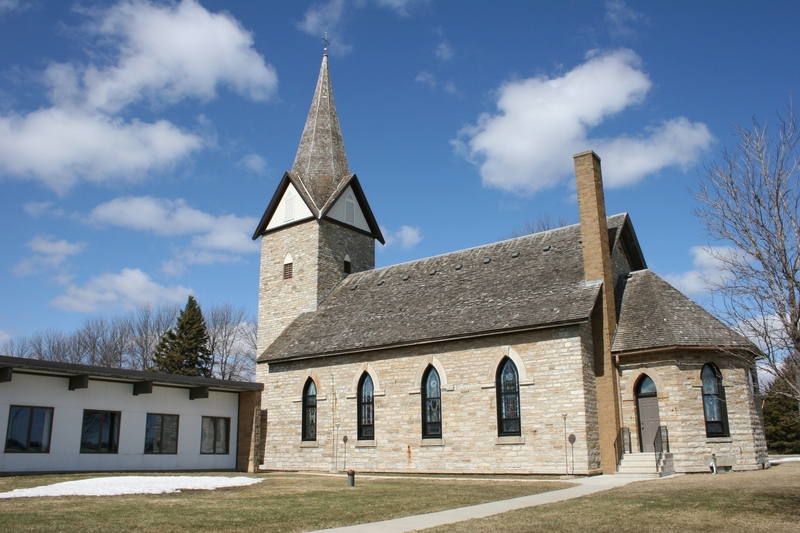 FYI: Click here for more information about St. John’s United Church of Christ, 19086 Jacobs Avenue, located near Nerstrand Big Woods State Park, rural Faribault. 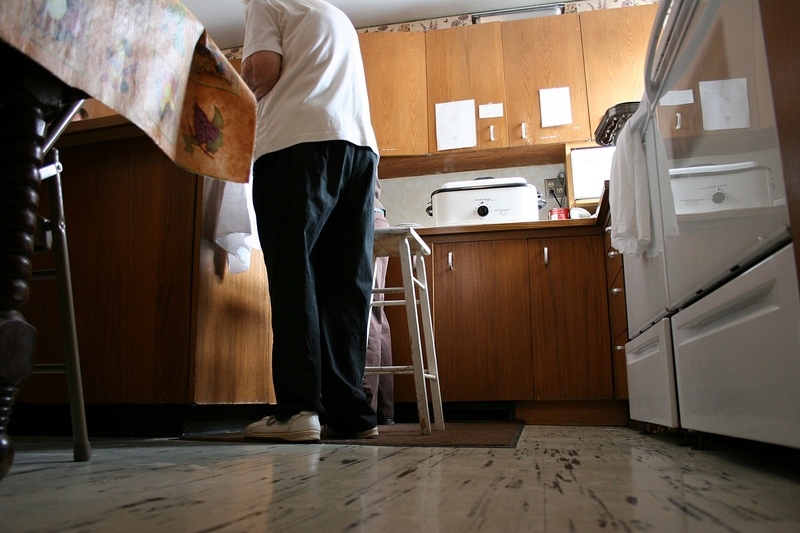 Watch for a future post featuring photos of the church interior and exterior. 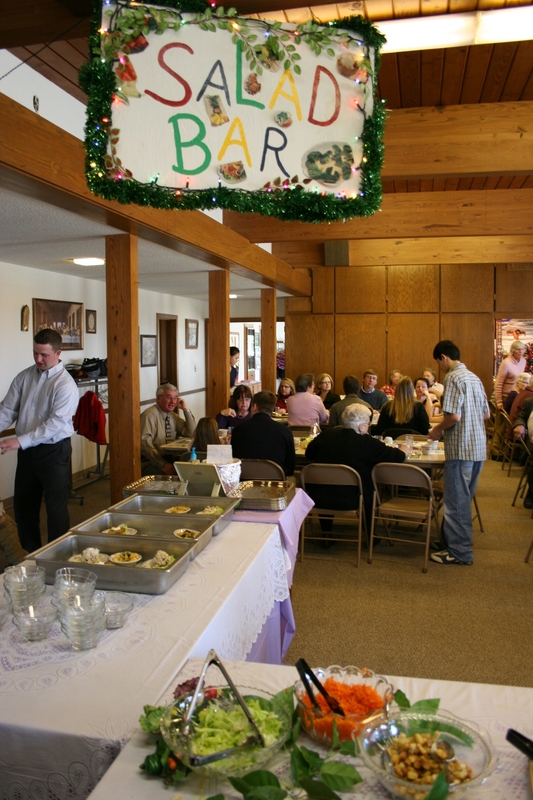 PLEASE SUBMIT A COMMENT and tell me about a church dinner you enjoy and why.